EMI analysis of recently-published FDIC data on 2014 marketing spending for 17 leading banks found that banks are beginning to grow their marketing budgets in order to drive revenue growth in a growing economy. The scale of the increase was relatively modest, a trend that we expect to continue in 2015, as banks look to marry their desire for revenue generation with a continued need to exercise a tight rein on costs. Total marketing spending for these 17 banks rose 4% between 2013 and 2014. 10 of the 17 banks increased their marketing budgets, 6 cut their budgets, while SunTrust’s marketing expenditure was unchanged. Net revenues for the 17 banks fell 2%; as a result, their marketing-to-revenue ratios rose by 16 basis points to 2.84%. Chase had by far the largest marketing budget at nearly $2.8 billion, up 2% from 2013. Four other leading banks (American Express, Citigroup, Capital One and Bank of America) had marketing budgets of more than $1 billion. 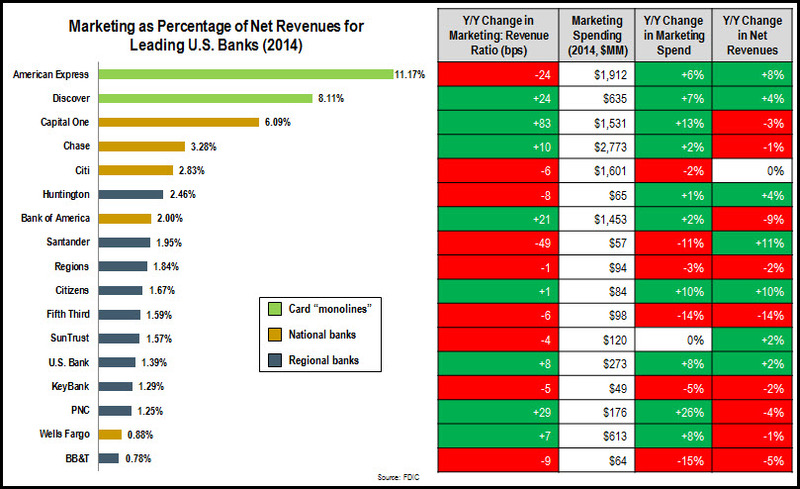 Of the 10 banks that grew their marketing budgets in 2014, 5 also showed increased revenues. The 4 banks with the lowest marketing-to-revenue ratios reported revenue declines between 2013 and 2014. The variation in marketing-to-revenue ratios among these banks is huge. American Express and Discover are primarily credit card issuers and lack branch networks; they tend to have marketing-to-revenue ratios of 8-10%, in line with fast-moving consumer goods (FMCG) companies. National bank marketing ratios tend to be around 3%, while regional bank ratios are generally between 1% and 2%. Even within these bank categories, there are significant variations. Capital One is a regional bank with a very significant credit card portfolio, so its marketing-to-revenue ratio (6.1%) falls between a monoline and a regional bank. Wells Fargo trailed its national bank peers in marketing spend. Although it grew its 2014 marketing budget by 8% to $613 million, its marketing-to-revenue ratio remains below 1%.